Greens and herbs are the secret to a successful and fragrant hortopita. In Crete, we have access to a big variety of greens year round so we can enjoy this hearty, nutritious meal any time. (Spinach, fennel leaves, leeks, nettles, dandelion sorrels, white beets, endive leaves, wild chicory, spring onions, dill, parsley, coriander) You can use some of them or all of them at same time. 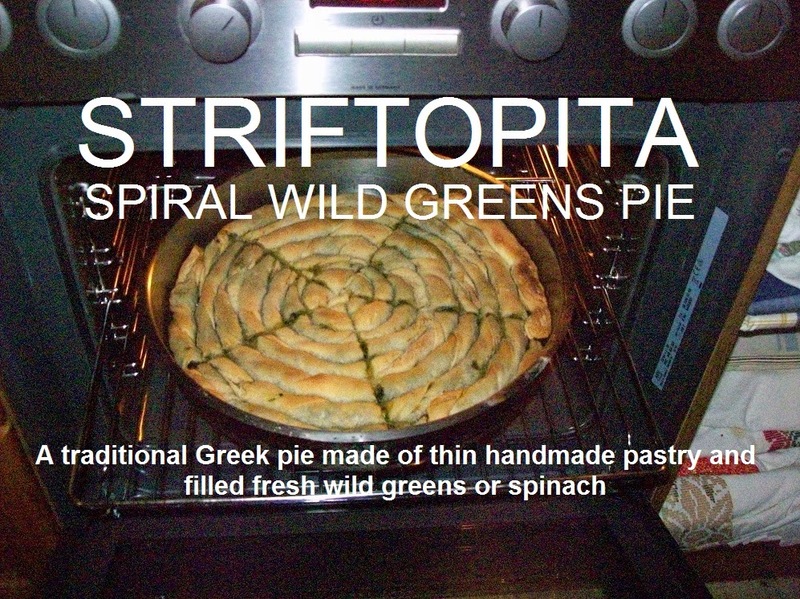 The combination of greens for this pie (pita = pie), include dandelion, sorrel and white beet greens combine with plenty of green onions and fennel leaves coarsely chopped, parsley and dill, olive oil, salt and pepper and the aromas of Cretan countryside will fill your kitchen. 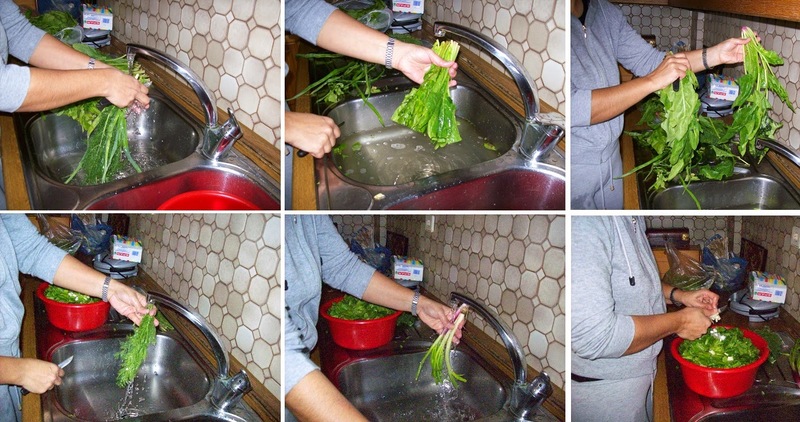 Rinse the greens well before adding to the pot. Chop greens and scallions into bite size pieces. You don’t want pieces that are too long in your pie. It just makes the pie harder to eat. Once the greens are chopped, place the greens in the pan. 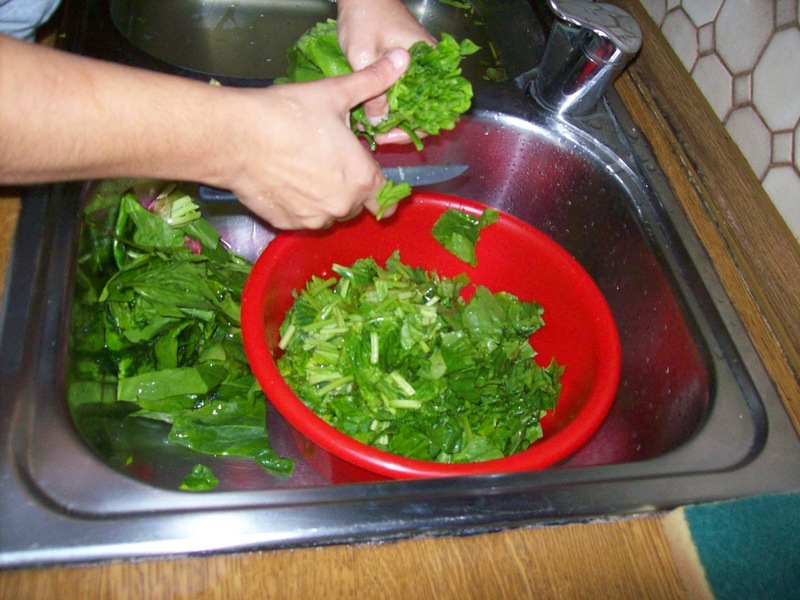 and cook for approx 15 – 20 minutes or until the greens are wilted down to about a third of their original amount. Remove pan from the heat and allow greens mixture to cool before use it to fill the pie. 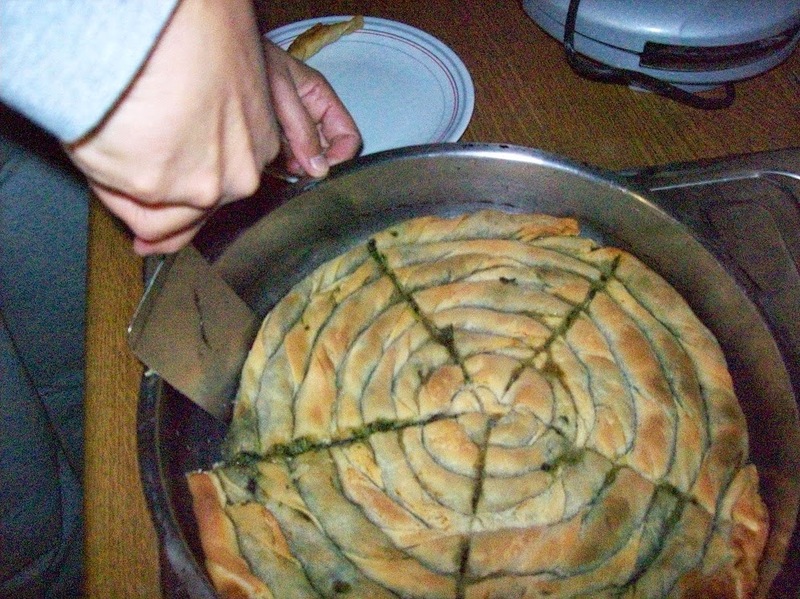 I use a 36cm round pan to make the spiral green pie. Feel free to replace their homemade phylo (easy to make thought) with the store-bought variety and make the pie in a 36cm round baking pan. 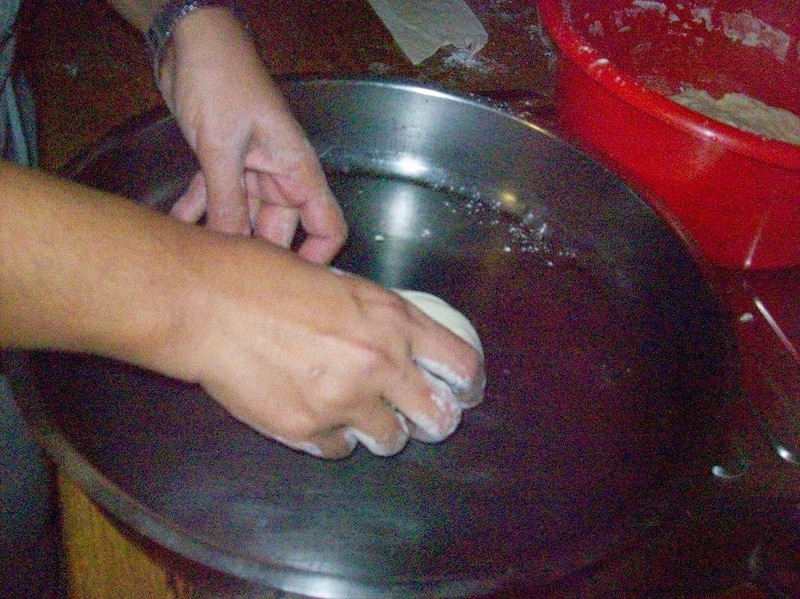 It's important to note that the phylo dough doesn’t need to be the extremely thin version we see in pastries, but rather reasonably thin and easily worked dough rich in olive oil. Mix all the ingredients together. 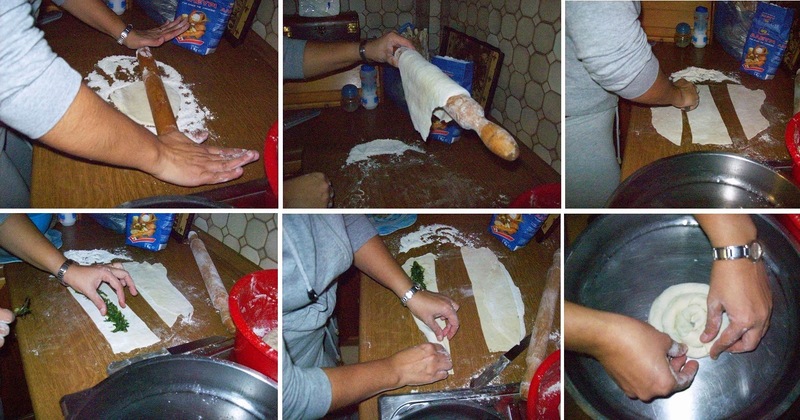 Form long sausages with the rectangle pastry sheets. Place them in rounds in the pan. We started our spyral from the centre. Once the green rolls are placed in the pan bake the pita in 180 Celsius / 360 degree oven for approx 45-50 minutes. At 20 minutes cooking time, open the oven and quickly, lightly sprinkle the top of the pie with water for a little bit of crunch. When you are ready to serve the pie, cut it in 5 pieces. 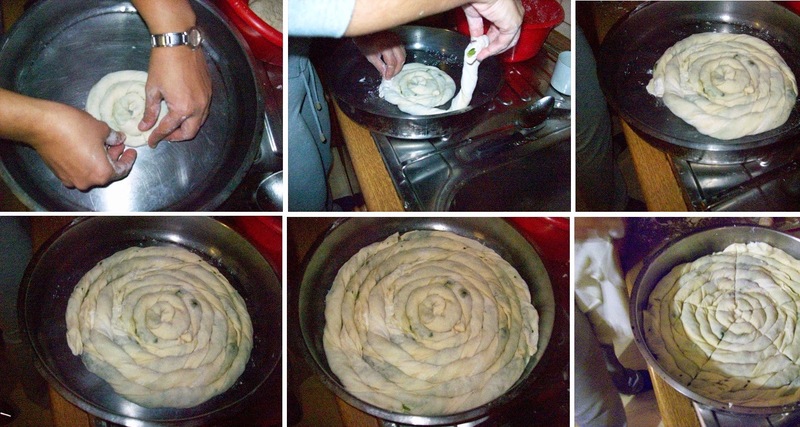 The pie is meant to be eaten in spiral bits. Αναρτήθηκε από George Portokalakis στις 12:46 π.μ. George Portokalakis 23 Νοεμβρίου 2014 - 5:51 π.μ.